The failing cables that will be replaced during a weekend Red Line shutdown could have put trains at risk of a high-speed collision, and Metro’s chief operating officer said Thursday that if not for an unplanned audit ordered by a relatively new manager, the problem could have gone undetected for many more years. WASHINGTON — The failing cables that will be replaced during a weekend Red Line shutdown could have put trains at risk of a high-speed collision, and Metro’s chief operating officer said Thursday that if not for an unplanned audit ordered by a relatively new manager, the problem could have gone undetected for many more years. The communications cables are part of Metro’s signaling and train tracking system. When they fail, train operators and controllers could get incorrect information about train locations or speeds. The audit, which was done between October and early December, reviewed 1,435 cable testing records from as early as late 2014 through the end of 2016. It identified 16 records that seemed suspect. Nine of those have not yet been retested. Out of seven that have, only three fully passed, said Metro Chief Operating Officer Joe Leader. Two others need to be replaced at some point in the relatively near future, and two, between Brookland and Fort Totten on the Red Line, need to be completely replaced right away in order for trains to resume normal service. For now, Metro is only allowing one train at a time between stations in that area. Leader disclosed that the first of the two cable failures was identified last Wednesday, and the second was found Sunday. Without the audit, the cables would not have been scheduled to be checked again for nearly a decade. “There’s not like an alarm that goes off or anything,” General Manager Paul Wiedefeld said. A failure of the system to identify a train on the tracks ahead, which would be one risk posed by failed communications cables, was a key issue noted during the investigation into the 2009 Red Line crash. “As soon as we had any concern with the potential, the possibility of that, that’s when we went to the absolute block operation,” Wiedefeld said of the decision to limit Red Line service until repairs can be made. The audit did not address any of the inspections of 7,500 more critical track-circuit cables that were inspected for the first time after the 2009 crash. Since those cables were last checked between 2009 and 2014, Leader said, they are next due to be inspected starting in about 18 months. Before the 2009 crash, Metro had never had a testing program for the cables. Metro has improved the cable inspection documentation since the start this year, Leader said, which coincides with Metro’s broader push for better documentation of inspection records after nearly half the track inspection department was disciplined. 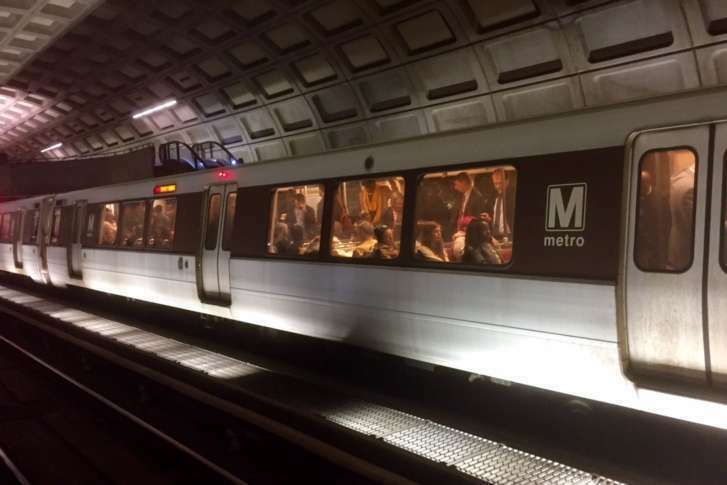 The new testing did not identify exactly what part of each cable had failed, so Leader hopes a full replacement during this weekend’s shutdown will allow Metro to restore regular Red Line service Monday morning. “In this case the cables that we found were in such a [degraded] state we had no additional spares to use, so the decision was made to … replace the cables,” Leader said. The communications cable issues come as Metro is considering whether to return to smoother automatic operations, which, like the manual operations the system has operated under since the 2009 crash, rely on the train location and speed information to run the system safely.